Each year, The Omega reviews the films presented at the Kamloops Film Festival. The festival runs through March 10. Raise your beers to this achievement in schlock that revels in everything obscene and nasty in our cold, Canadian world. Lou Garou is back as the half canine cop out to protect his small town no matter how inebriated he may be. This time he must face off against an evil hockey team as well as a shady businessman looking to monopolize the local brewing industry. What follows are essentially what you would come to now expect with this B-movie reverence. Director Lowell Dean and Leo Farrard re-team to have a good time and not give a damn how they have it. 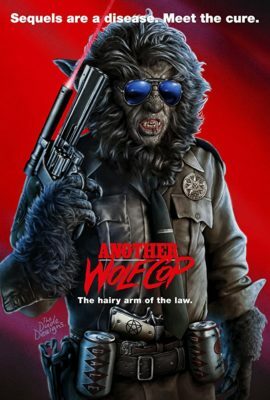 They mark their increased budgets with a larger need for pyrotechnics and action with the actual Wolfcop suit looking slightly upgraded from his previous incarnation. While the shininess of the original has slightly dimmed, character growth that does happen for Lou, which while minimal, still shows a care that the filmmakers must have for this, their impossible creation, with the enjoyment emanating from the villains unabashed EVILNESS screaming at you to have a fun time. And you know what? It is fun, a great time to sit back, sip a cold one and enjoy in the simple things in life. Be that beer, doughnuts or WolfCop killing bad guys with a hockey stick. Your choice though.